Camille Pissarro, the “Father of Impressionism,” was among the most significant contributors to the movement and is remembered for being universally championed by his contemporaries, both artists and critics alike. His influence on the trajectory and development of Impressionism extends to myriad twentieth century modern art movements. We are pleased to offer an extensive private collection of prints and drawings by Pissarro in our November 3 sale of Old Master Through Modern Prints, Featuring Camille Pissarro: Impressionist Icon. 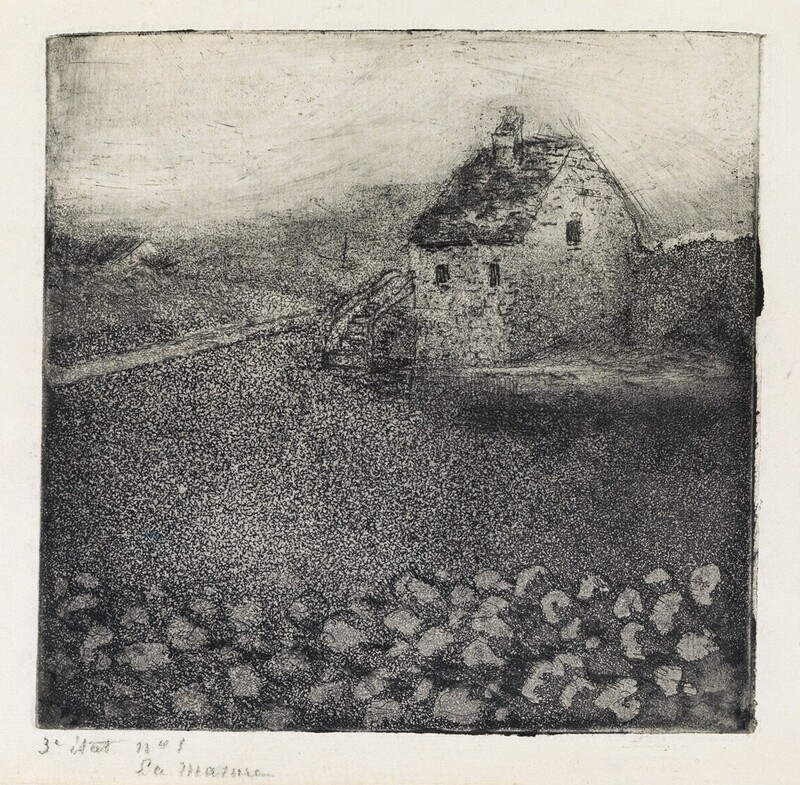 Lot 254: La Masure, etching and aquatint, 1879. Estimate $15,000 to $20,000. Pissarro moved to Pontoise, France, in 1872. There he began a close collaboration with Paul Cézanne, who moved to the area the following year. In the late 1870s he also began working closely with Edgar Degas, a major proponent of printmaking, who introduced him to the wide potentials of the medium. Pissarro experimented with Degas to produce prints with impressionistic effects, and, in turn, Degas printed color proofs of some of Pissarro’s etchings. During this time, Pissarro became ceaselessly experimental with his printmaking. When looking at prints from this period, it can be difficult to discern exactly what medium or process he implemented to achieve certain effects. Along with being radically experimental, he was also meticulous and printed only very limited, high quality impressions. He often insisted upon printing his own proofs and was diligent about choosing specific quality papers that would complement each composition. 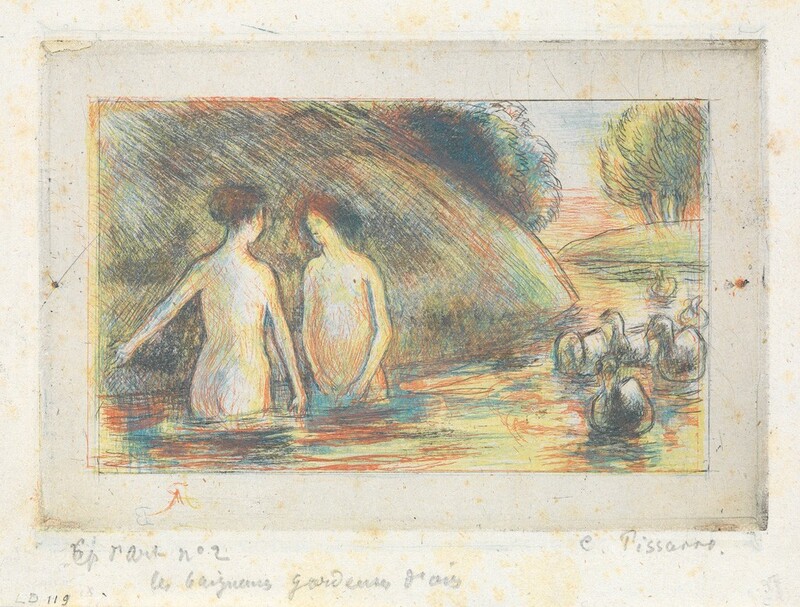 Lot 302: Les Baigneuses gardeuses d’oies, color drypoint, circa 1895. Estimate $15,000 to $20,000. In 1873, along with Degas and Monet, Pissarro wrote the manifesto for the formation of Société Anonyme des Artistes, Peintres, Sculpteurs et Graveurs, marking the beginning of Impressionism. The group showed their work independently, abandoning the traditional means of exhibiting in France in private Salons for over two centuries. Pissarro was the only Impressionist to be included in each of the eight exhibitions organized by the Société from 1874 to 1886. 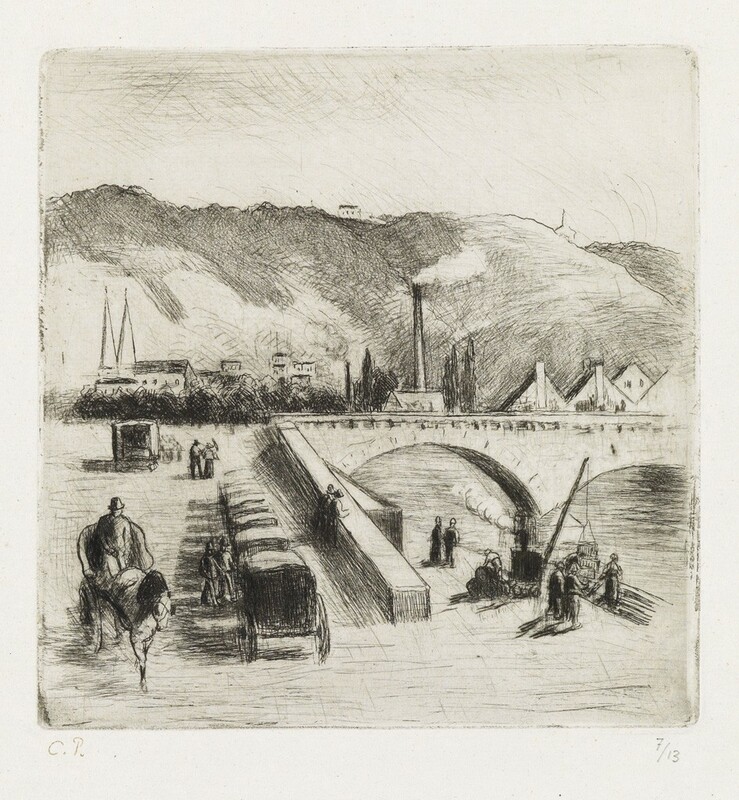 Lot 278: L’Île Lacroix, à Rouen, drypoint, 1883-87. Estimate $1,500 to $2,500. While Pissarro was based primarily in Pontoise and depicted the suburban areas surrounding Paris, he developed an ongoing interest with the city of Rouen. In an effort to infuse his work with new themes, Pissarro first visited the Normandy capital in 1883. The suggestion came from Monet, who favored the city’s majestic cathedral, stately bridges and bustling life. Though Monet was chiefly occupied with Rouen’s medieval architecture, Pissarro focused his attention on more dynamic industrial scenes surrounding the port and bridges. The artist compared Rouen to Venice, citing its visual beauty as well as its role as a muse. 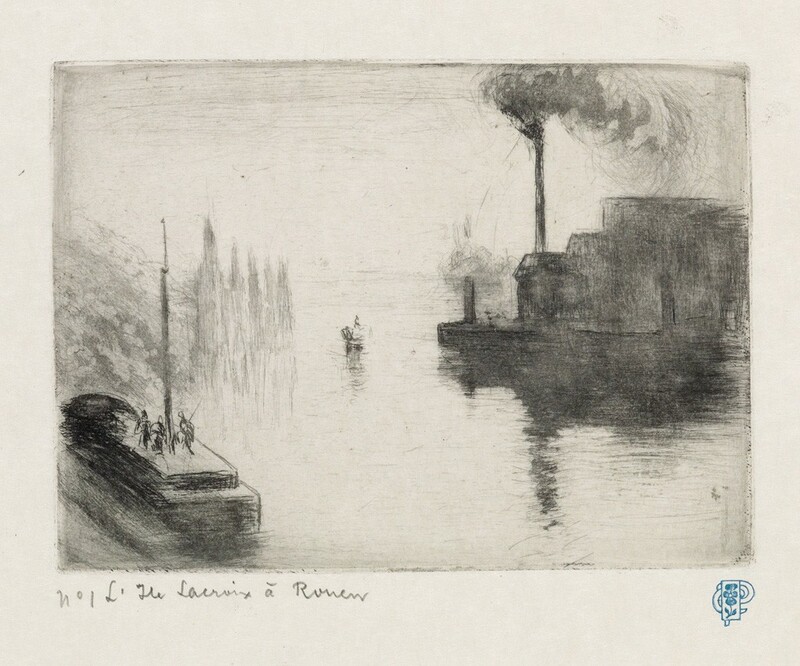 Lot 283: Quai de Paris, à Rouen, etching and drypoint, 1896. Estimate $2,000 to $3,000. The vibrancy of life in Rouen served as an ideal backdrop for Pissarro’s Impressionist masterworks. His paintings and prints include hallmarks of modernity along the Seine, with a flood of steamboats, iron bridges like Pont Boieldieu and the newly-constructed Gare de Rouen Orléans train station. Prints like Port de Rouen (avec Cheminées) (below) and Quai de Paris, à Rouen (above) are dominated by smokestacks, steam and laborers. Pissarro gave visibility to the technology and anonymous laborers driving progress in France at the end of the nineteenth century. 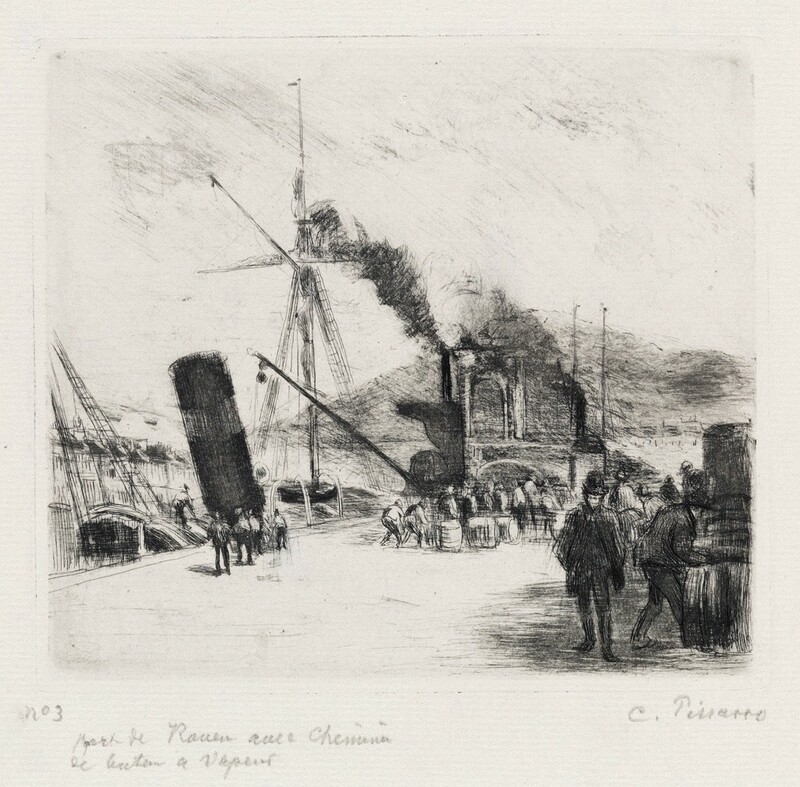 Lot 277: Port de Rouen (avec cheminées), drypoint, 1885. Estimate $8,000 to $12,000. Rue Géricault, à Rouen, 1896. Lot 287, left: Lithograph. Estimate $6,000 to $9,000. Lot 285, center: Etching and drypoint. Estimate $7,000 to $10,000. Lot 286, right: Lithograph. Estimate $7,000 to $10,000. 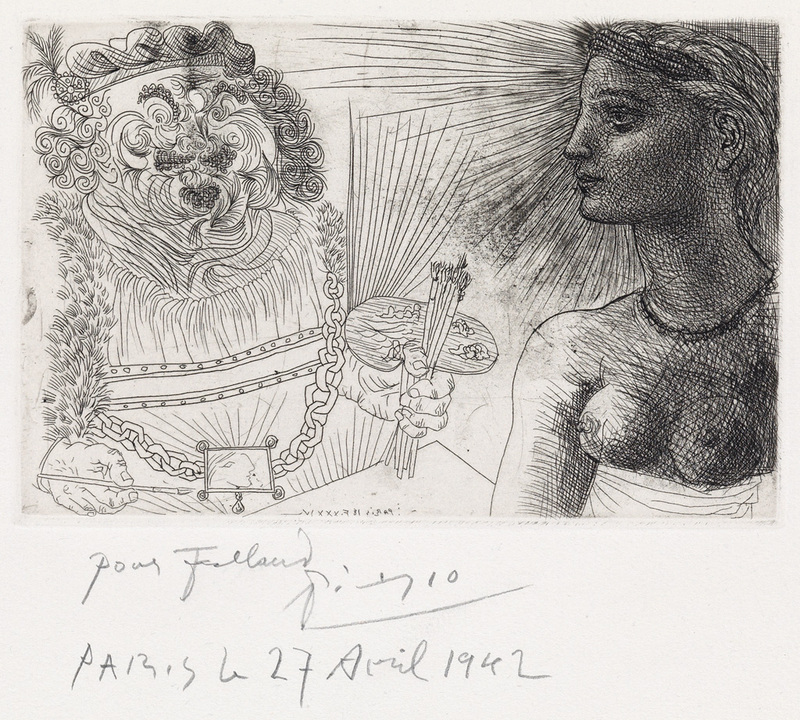 The prints he completed of Rouen comprise a significant part of the current collection, each example providing a glimpse into the artist’s unique perspective on modernity. The variety of imagery, from quiet street scenes to busy industrial ports, highlights Pissarro’s versatility and commitment to innovation over the two decade-long span of his visits. 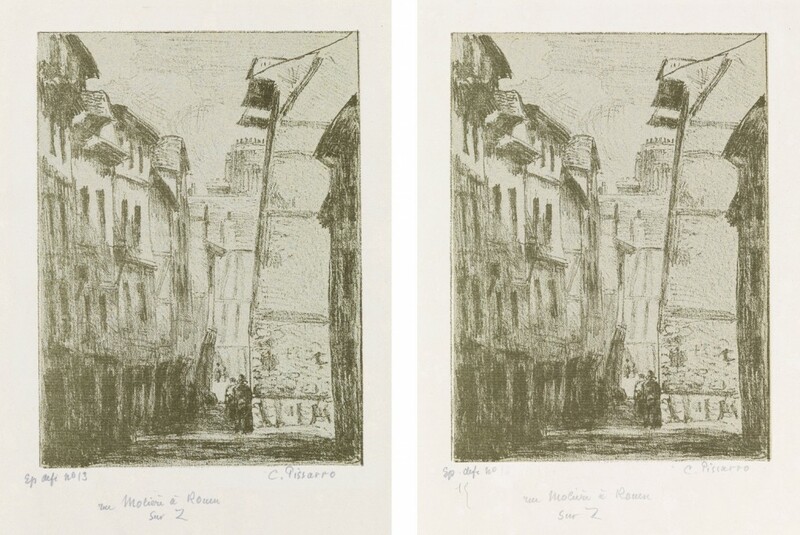 Lots 288 & 289: Rue Molière, à Rouen, lithographs, 1896. Each estimate $6,000 to $9,000. Of the Impressionists, Pissarro was the most prolific printmaker, producing nearly 200 etchings and lithographs from 1863 to 1902. From 1890 onward, a recurring eye ailment left him unable to paint en plein air, forcing him to work indoors and encouraging his production of prints. He began making lithographs in earnest in 1894, producing around 50 in the span of a decade. His experimental artistic leaning extended to lithography as well: he employed unorthodox techniques and explored a number of different subjects. Pissarro famously collaborated closely with the talented printer George Thornley to create a series of lithographs reproducing some of his cherished paintings, some of which are included in the current collection. In addition to the complete Pissarro collection (lots 250-317), see the catalogues for Old Master Prints (lots 1-249) and 19th & 20th Century Prints (lots 318-540).